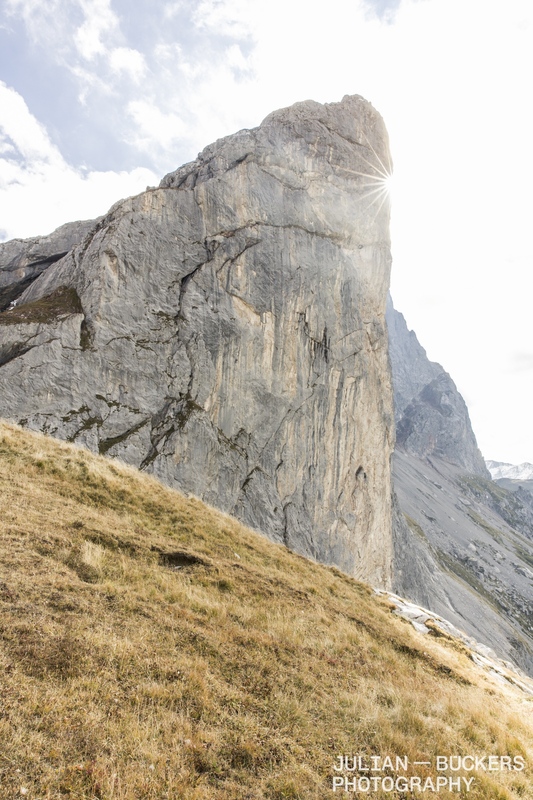 In the beginning of October we’ve spent three days at Swiss Rätikon for some multipitch climbing. Rätikon to climbers is well known for its hard alpine climbs on outstanding limestone and the surrounding beauty of mountain nature. It is located up in the mountains on an altitude above 2000 meters and is divided into two parts, a Swiss and an Austrian but the walls are mostly south facing so you predominantly climb on the Swiss side. The closest village is called Schuders consisting of only a handful houses. This time we were climbing at the Schweizereck in the region around Grüscher Älpli besides the other parts of the wall such as Kirchlispitzen (known for routes like Silbergeier, Unendliche Geschichte and WoGü), Drusenfluh and Drusentürmen. 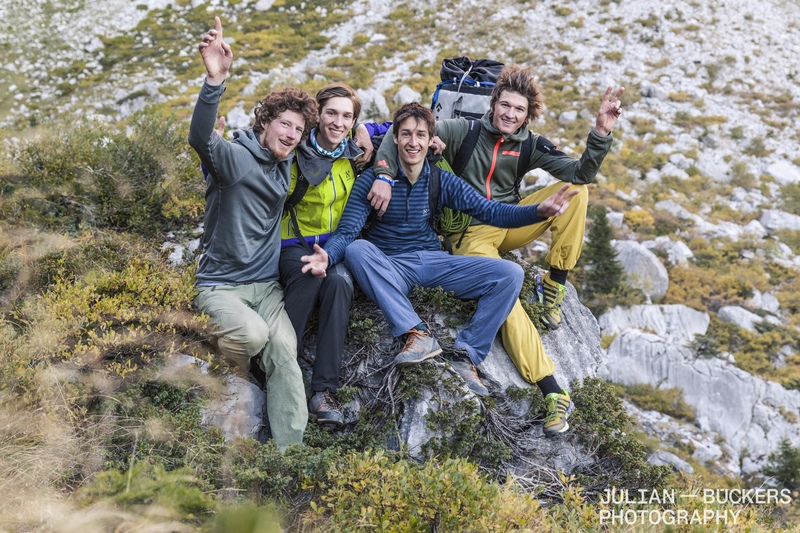 It was our first multi pitch experience ever and we could share it with multi talent Michi Wohlleben and photographer and mountain guide Julian Bückers. They were introducing us the required belaying techniques for alpine routes and supporting us up there every time we needed some help. During this short but really enjoyable time we were curious and attentive as small kids. Greedy for knowledge waiting for the new adventure to come. It is always nice to feel that there is still high motivation and exaltation when trying new things and there are a lot of things we haven’t seen in climbing yet although we’ve already practiced it for almost 15 years now. That’s such a great aspect of climbing. That’s its unique variety and we love it. On the second day we woke up at 7 a.m. and had a nourishing out meal. Well rested and euphoric we hiked up to New Age, our main mission for this stay. Austrian pioneer Beat Kammerlander opened it as one of the extreme multi pitch classics back in 1989. Such a big achievement back then and always worth to remind yourself what this has meant during this time. A milestone. It’s located at Schweizereck and is 5 pitches long (150 meters, first pitch starts at 100 meters above the ground, until there it’s easy climbing but you have to belay each other). It’s mainly very technical climbing on compact and sometimes very sharp rock with a powerful roof passage in the third and hardest pitch. Well, we got our asses kicked in the beginning. Already the first two pitches (7a and 7c) turned out to be super special and technical. 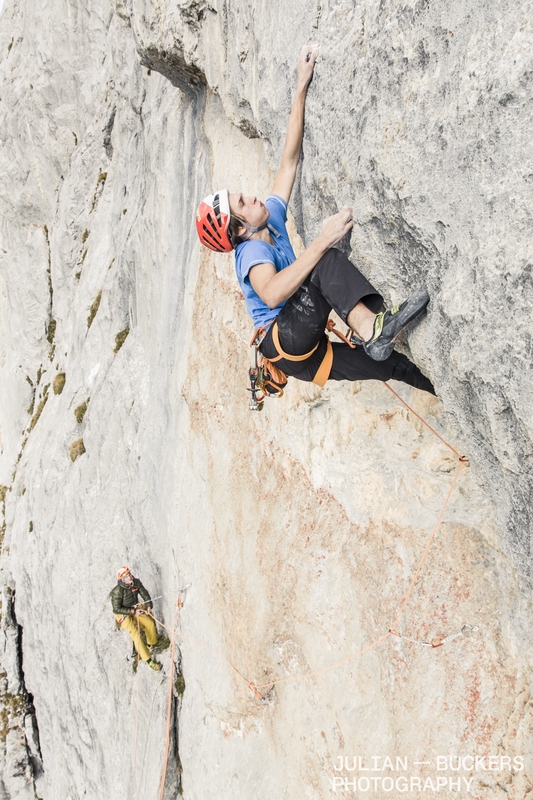 We were bewildered as climbers who already have sent 9a but they told us that alpine climbs and grades are tough compared to the modern sport climbing disciplines and now we know that it’s true. It does not mean that the climbing itself is harder but it’s the stress and pressure which comes along with longer bolt distances, own mobile placements, technical climbing styles and of course the heights. We were also very slow but that’s normal as „beginners“. Professionals have a collective routine and flow. It’s about fast partner shifts, belaying and knowing what to do in different cases. You have to be spontaneous as a good alpine climber. David was leading the first two pitches and it was a true struggle from the very first moves on. It was so cold that it was impossible to get warm fingers to feel the holds. He somehow made it up until the belay below the roof of the third pitch although some sequences almost shook him off the wall. He fought and even sometimes screamed but that comes out by its own when you try hard and need to push yourself. It should have been a team ascent so we switched knots and decided that Ruben should lead the third and hardest pitch. The weather started to clear and it was only a matter of time that the sun started to reach our belay to encourage us with its warmth. Ruben started to reach the crux moves, slowly pulling over the edge of the roof but then he fell on the crucial move, a long move from a jamming side pull one pad crimp high up left to another crimp of the same size, hitting his wrist against the rock. David lowered him off to the belay that he could get his down jacket back on to warm himself. 5 minutes break and then it was time to give it another shot but the same happened again. Back to the belay. Not sure what to do, still freezing and a bit frustrated Michi pulled out his mobile phone and showed us some videos of old men sitting in a bar and making funny jokes about alcohol. We started to laugh and then the sun came around the corner and started to touch our helmets on our heads. In retrospect these were the two recipes which probably saved us the ascent of our first demanding multi pitch. David started to take over the lead again, fell once even before the crux slipping away with his foot, returned to the belay and managed to get up to the next belay without falling into the rope in his next try. That was refreshing and we got the energy and confidence back again to reach the top. We threw all of our gear into our backs and hiked back to the car. When we got there we were even more tired than the day before (we expected that) but the feeling that everything worked well in the end and that we’d completed our mission was stronger. We sorted our gear, shared some victory cookies and had a fresh little beer before Michi and Julian left with their car on the way back home. Such an experience with all its components keeps staying in our minds and it motivates us to face new alpine projects and challenges in the future. We’ve already got some lines on our tick list which definitely are even more challenging than New Age. We are very satisfied to have done it as our first multi pitch though and we think that Michi and Julian showed us all the skills to conquer new heights soon. Thanks for your great work guys and to our partners Scarpa and Petzl for making it all possible. We are really looking forward to climbing in the future together again in the same style and with the same motivation and good vibes as this time. Thank You and take care! Dieser Eintrag wurde veröffentlicht in Allgemein und verschlagwortet mit 8A, alpen, alpine climbing, alps, austria, bad ragaz, beat kammerlander, climbing, david firnenburg, drusenfluh, drusentürmen, escaladrome, firnenburg, firnenburgbrothers, fläsch, graubünden, grüscher älpli, haglöfs, julian bückers, julian bückers photography, kirchlispitzen, Klettern, lead, make moves no war, michael wohlleben, michi wohlleben, mountain, mountains, multi pitch, new age, outdoor, petzl, rätikon, rock, ruben firnenburg, scarpa, schuders, schweizer eck, schweizereck, silbergeier, switzerland, tamina valley, taminatal, unendliche geschichte, wogü von admin. Permanenter Link zum Eintrag.